SAN FRANCISCO--(BUSINESS WIRE)--Twitch, the world’s leading social video platform and community for gamers, today announced the debut of a full-time Food channel (twitch.tv/Food) where it will be launching with all 201 episodes of Julia Child’s The French Chef. Inspired by the success of its cooking community, Twitch is hosting the event to honor Child, television’s most influential chef in its day and a precursor to the interactive cooking shows prevalent on Twitch. Child also focused on food as a way to build a community in the same way broadcasters on Twitch bond with their audiences. The Food channel lives in Twitch’s Creative section where the creative process--whether it be cooking, crafting, composing or other art forms--is celebrated. On March 15th, 1951, Julia Child graduated from Le Cordon Bleu in Paris and years later returned home to Cambridge, Massachusetts to revolutionize the world of culinary arts. With her many books and TV shows, she set the precedent for what a cooking show should be--engaging, educational, inspiring, and funny. Today, on the anniversary of her graduation, Twitch Creative celebrates Julia's life and work with an all-episodes marathon of The French Chef. The French Chef originally ran from 1963-1973 with the Twitch marathon compacting the entire series into a four-day event beginning on March 15th at 2:00pm PT. 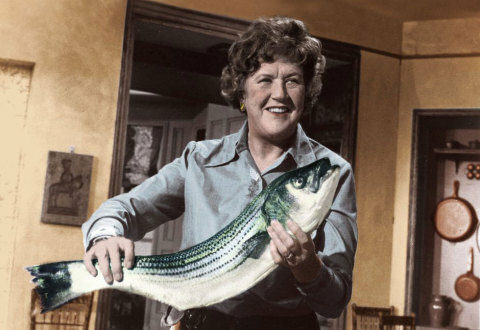 The Julia Child Remix - Keep on Cooking, courtesy of PBS Digital studios, will be airing throughout the marathon to help celebrate the joy of cooking. DomesticDan: Dan started off as a variety gamer and moved into cooking on stream. He recently quit his job and is moving toward full time streaming. CookingForNoobs: Christine cooks and bakes on her stream and has even created works of food art based on Bob Ross paintings. FakeGamerGirl: Ashley cooks vegan food including adaptations of popular meat dishes like fried chicken. Because of her passion, Twitch Creative hired her last month. Goldamsel: Franziska is a variety broadcaster known for her positive attitude, her Just Dance broadcasts, and her high production quality cooking streams. WorkingChef: Chef is a 10 year professional in culinary arts. She shares her love of cooking and is not afraid to drop some knowledge bombs about how to cook. Lulaboo: Lulaboo shows off her Culinary Arts degree skills while creating delicious food. While the launch of the Food channel is focused on Julia Child, it will soon be home to other cooking related shows following the marathon. For Twitch Creative news follow @TwitchCreates on Twitter and for general company and community news, visit the Twitch blog, Twitter, Instagram and Facebook pages.